Ireland is home to exceptional and outstanding talent in many fields: Riverdance, the Celtic harp, U2, famous authors: James Joyce, Jonathan Swift and Bram Stroker, and drinks like Guinness and Jameson. But did you know that “The Éire of the Irish” is also home to a brilliant way to teach prediction markets to university students? 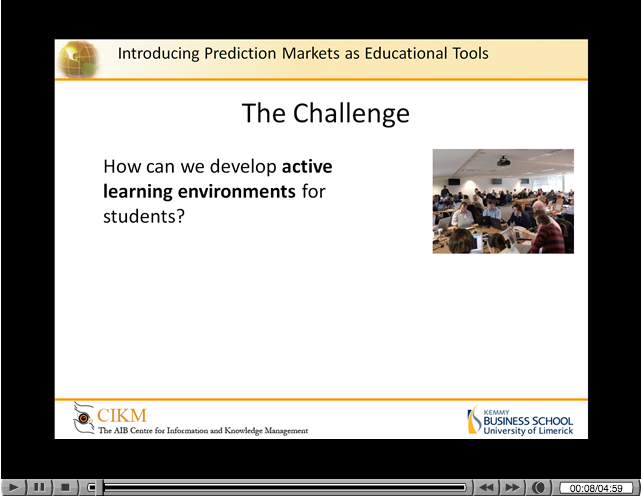 Let’s take a look as one university uses gamification. Most of the world pays close attention to how the stock market is doing. People invest based upon their predictions of where the market is headed. Collectively, investors drive the market. The Stock Market is just one example of prediction markets. The market prices can indicate what the crowd thinks the probability is of the event. This is called collective forecasting. A few years ago, an article in the Harvard Business Review aptly describes it with a humorous example. 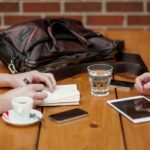 Andrew McAfee shared an excerpt from a letter he received after teaching a course on the subject to executives from a very large corporation. He had emphasized the huge benefits of harnessing collective intelligence, or the wisdom of crowds. So how has the University of Limerick chosen to teach this concept? Dr. Patrick Buckley, commonly called Paddy, is a lecturer at Kemmy Business School. 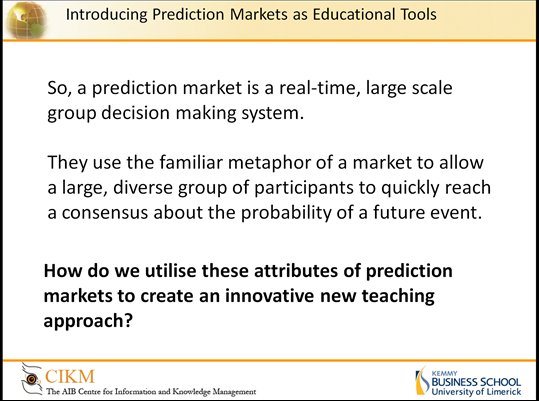 His research focuses in the use of prediction markets as a decision making tool to improved organizational effectiveness and efficiency. 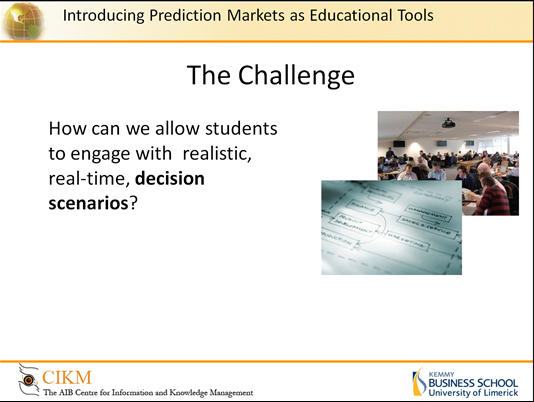 Creating a collaborative forecasting tool, the university developed simulated real-world decision scenarios. 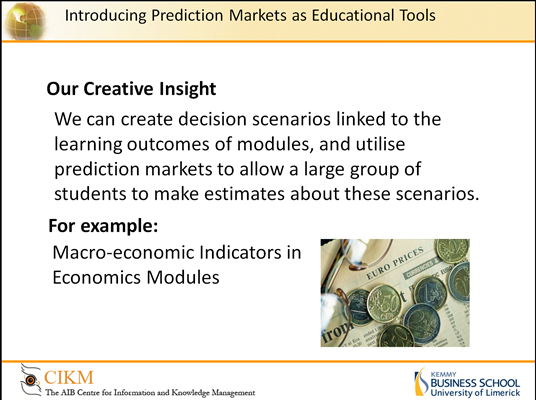 The scenarios are linked to module learning outcomes. 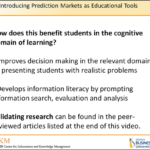 As a continuous assessment project, students are provided virtual cash to begin but can increase or lose based on their predictions. Successful predictions bring more cash. Poor forecasts result in a loss of investment. 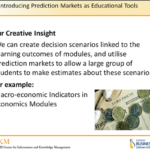 This forecasting market game can continue for days or weeks. As students move through scenarios, feedback is constant. Fortunately, the program is designed with scalable feedback channels so not to tax administration. The University of Limerick takes this collaborative forecasting technique and applies it to a range of disciplines including economics, tax, risk management, politics, and finance. 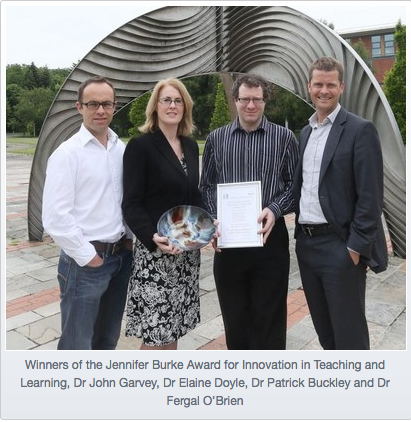 It is with good reason Dr. Buckley won the Jennifer Burke Award for Innovation in Teaching. 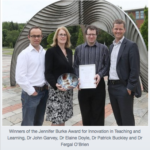 Ireland can add Dr. Buckley and the University of Limerick’s Collaborative Forecasting tool to their long list of exceptional and outstanding talent! The University of Limerick wanted to improve student engagement, motivate learning, improve students’ discipline knowledge and enhance information literacy. 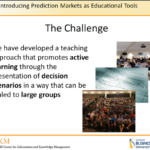 Dr. Patrick Buckley, a Lecturer in Information Management in the Department of Management and Marketing, Kemmy Business School determined to develop an online simulation tool. 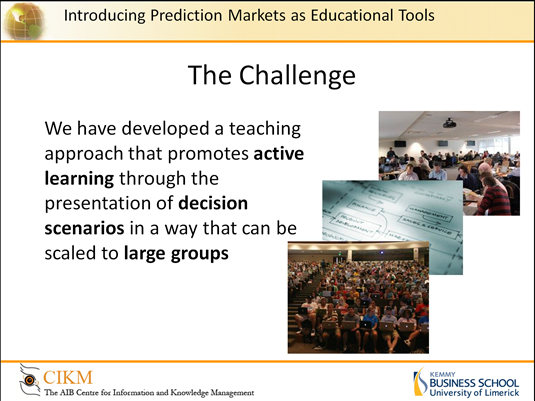 Sharing his expertise in the use of prediction markets as a decision-making tool to improve organizational effectiveness and efficiency, Dr. Buckley created a “collaborative forecasting tool” that provides students with real-world scenarios in a competitive and dynamic group activity. According to Wikipedia, Prediction markets (also known as predictive markets, information markets, decision markets, idea futures, event derivatives, or virtual markets) are exchange-traded markets created for the purpose of trading the outcome of events. 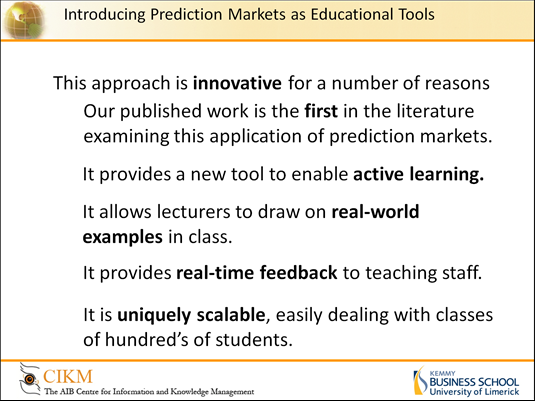 Simply put, prediction markets utilize contracts where the value depends upon forecasting future events. A scenario might be a project manager trying to gauge if a project will be completed on time. A contract is created with returns dependent upon the outcome. If the project is completed on time the contract holder gets a 100% return, if not, 0%. The participants (contract holders) can buy or sell depending on their belief in the project manager meeting the deadline. The price of the contract varies based on the collective assessment of the group’s prediction. The University of Limerick takes this collaborative forecasting technique and applies it to a range of disciplines including economics, tax, risk management, politics, and finance. 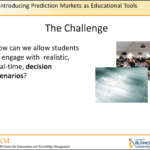 Running forecasting markets that can continue for days or weeks allows students the opportunity to make and revisit decisions as they respond to changing information. 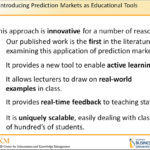 Forecasts are tied to specific learning outcomes. 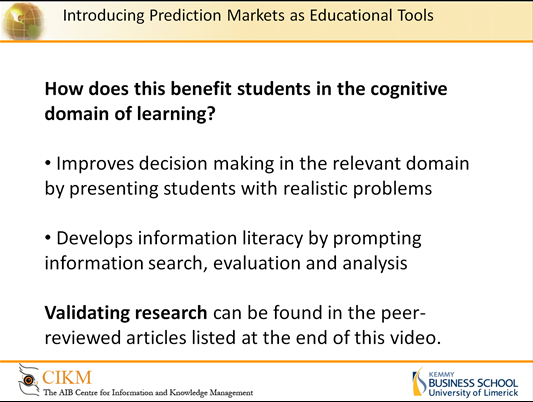 As a continuous assessment project, students are provided virtual cash to begin but can increase or lose it based on their predictions. Successful predictions bring more cash. Poor forecasts result in a loss of investment. In order to prevent students from becoming discouraged should they make poor decisions, the endowment can be reset. As students move through scenarios, feedback is constant. Fortunately, the university designed their program to provide a range of scalable feedback channels without taxing administration. 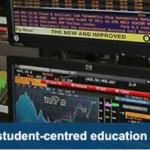 Students receive feedback from the operation of the market and through emails detailing performance as well as identifying correct or incorrect outcomes. Lecturers can utilize the project and integrate analyses of anonymous examples. 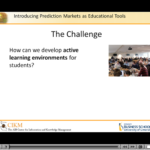 Students claim to have greatly benefited from using the online simulation tool. Most found to forecast, or predict, well required them to access and synthesize information from a wider range of sources. Ascertaining reliability and identifying biased sources while dealing with information overload improved their information literacy skills as well as increased their general disciplinary knowledge. Dr. Buckley’s clearly demonstrates how to increase student engagement and motivate learning through his award-winning, innovative pedagogical approach. 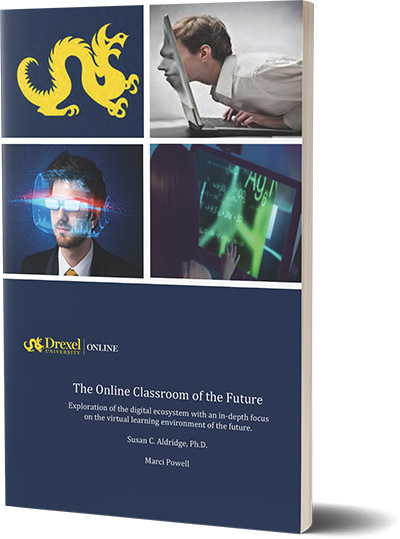 More information can be gathered from several published research papers as well as a book, Innovative Business Education Design for the 21st Century, he co-authored with several colleagues. 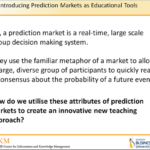 Using this collaborative forecasting online simulation tool is an excellent way for students to put theory and research into practice in the real world. It provides a wonderful opportunity to implement proven mature pedagogical innovation across a wide variety of contexts and situations.